In the circuit below, A and B represent two inputs and C represents the output. If the inputs A and B are low, the diodes nwill not conduct and the potential at the output point C will be low (ground potential). If either A or B is high (at high voltage level), the corresponding diode will conduct and will place the output point C at the high voltage level. If both A and B are high, again the output will be high. The circuit therefore implements OR operation [Option (3)]. In the above question we have taken, as usual, the high voltage level as the logic 1 level and the low voltage level as the logic 0 level. This system is the positive logic system. If the low voltage is taken as logic 1 level and the high voltage is taken as logic 0 level, the systerm is called negative logic system. Unless specified otherwise, all systems are positive logic systems. 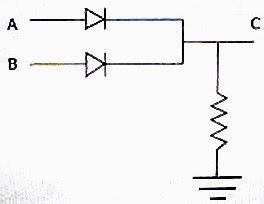 In the negative logic system, the above circuit will become AND gate. The second gate is a NAND gate. Since its inputs are shorted, it functions as a NOT gate. So the circuit is a NOR gate followed by Two NOT gates. NOR followed by NOT is OR and OR followed by NOT is once again NOR. So the correct option is (2). [The negative sign shows that the recoil velocity of the gun is opposite to the velocity of the shell]. This gives v2 = 104 so that v = 100 ms–1. Since there is a time rate of change of momentum equal to Mv per second, the force required is Mv Newton. Students I, II and III perform an experiment for measuring the acceleration due to gravity (g) using a simple pendulum. They use different lengths of the pendulum and/or record time for different number of oscillations. The observations are shown in the table. Least count for length = 0.1 cm. Least count for time = 0.1 s.
[The above expression is obtained by taking logarithm of both sides and then differentiating. Note that the sign of the second term on the RHS is changed from negative to positive since we have to consider the maximum possible error]. Thus EI is minimum so that the correct option is (b). A firm manufacturing electronic watches claims that the maximum error in the time indicated by their watches is 5 seconds in six months. What will be maximum possible difference between the times indicated by two watches in one year? This is a very simple question. But you must remember that both positive and negative errors are possible. The maximum possible difference between the times indicated by the watches will be obtained when one watch loses time (slow) and the other watch gains time (fast). The maximum time lost in one year is 10 s. The maximum time gained in one year also is 10 s. Therefore, the maximum possible difference between the times indicated by the clocks in one year will be 20 s.
While attempting to solve problems in optics related to spherical mirrors and lenses, many among you will have some confusion about the application of the inevitable sign convention. Get your confusion cleared by going through the post on this site here. You can find all posts in optics on this site by clicking on the label ‘OPTICS’ below this post. Your doubts regarding the application of the sign convention can be cleared completely only by working out questions involving the sign convention. (1) Crown glass of refractive index 1.5 is used to make a plano concave lens of focal length 40 cm in air. What should be the radius of curvature of the curved face? 1/f = (n2/n1 – 1)(1/R1 – 1/R2) where ‘f’ is the focal length of the lens, R1 and R2 are its radii of curvature, n2 is its refractive index and n1 is the refractive index of the medium in which the lens is placed. This gives R1 = –20 cm [Option (a)]. You obtain the answer as negative in accordance with the sign convention, indicating that the curved face is concave towards the incident ray. If you had taken the second face as curved, you would have put R1 = ∞ and the answer would be R2 = 20 cm. This too conforms to the Cartesian sign convention, indicating that the second face is convex towards the incident ray and hence the radius of curvature is positive. In the present problem, there will be no need of worrying too much about the sign convention if you remember that the focal length (in air) and the radius of curvature will have the same value in the case of biconvex and biconcave lenses of equal radii of curvature if the refractive index of the lens is 1.5. In the case of plano convex and plano concave lenses made of material of refractive index 1.5, the radius of curvature of the curved face will be half the value of the focal length. You may substitute the same values for the focal length in air and the radii of curvature of the faces in the lens maker’s equation and satisfy yourself that the refractive index of the lens is 1.5. [Since it is a biconvex lens, f is positive, R1 is positive and R2 is negative. Also, put the numerical values of R1 and R2 equal to f].Since the refractive index of the liquid is the same as that of the lens, there is no convergence or divergence for the rays of light and the focal power will be zero. 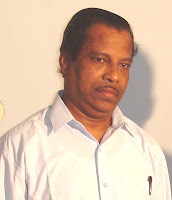 The above question appeared in Kerala Engineering Entrance 2008 question paper. 1/f = (1.4 – 1)(1/0.15 – 0) = 2.66 nearly. You will find more useful questions at apphysicsresources.